This fiesta could only be described as Jerry’s fantasy, not Jerry McGuire, but Jerry-the little mouse from Tom and Jerry. The wackiest festival for all cheese lovers by far, Cooper's Hill Cheese-Rolling and Wake, is an annual event held at Cooper’s Hill, England, where people of all demographics come to race against a giant sphere of cheese. A mouth watering thought isn’t it? Well not really. This is a food fest where participants slip, somersault and tumble their way to the bottom of a cliff. During this bone-crunching marathon - and the first person to grab the cheese wins. 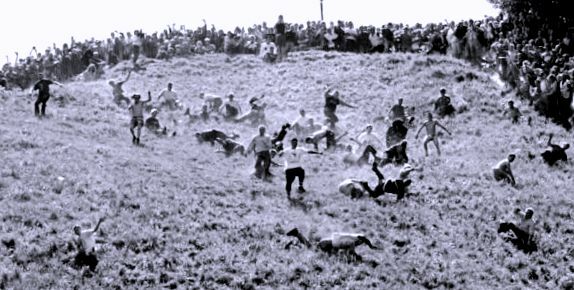 Traditionally, every year on the Spring Break day the residents living in and near the Brockworth village participate in the Cheese Rolling event. Off late people from all over the world have started showing up for participation. The tradition of cheese rolling is about two centuries old, and is considered to have its roots in a heathen festival to celebrate the return of spring. The festival derives its name from the location where it is celebrated-Cooper's Hill, a hill near Gloucester in the Cotswolds region of England. The cheese used for this event is Double Gloucester, a hard cheese typically manufactured in cylindrical blocks. The current supplier is local cheese maker Diana Smart who has supplied the cheese since 1988. With the introduction of rationing during the Second World War, use of cheese was prohibited. Consequently, from 1941 to 1954 a wooden "cheese" was used instead with a piece of cheese in a hollow space in the centre of the wooden replica. The Cooper's Hill Cheese-Rolling and Wake is often accompanied by a lot of mayhem and bruises. Thrill seekers who come to witness and partake in this adrenaline pumped event, chase a cheese off a cliff and tumble 200 yards to the bottom and in probability to be packed off to a hospital afterwards. 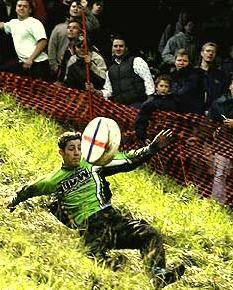 The Cheese Rolling sport has found its way into popular culture as well, thanks to Television and Social Media. Cheese rolling is an online game on the virtual pet site Neopets and carries the same rules. In March, 2010, a video game which pays homage to the event titled "Cooper's Hill" was released for the iPhone and iPod Touch. Due to the extreme nature of the sport, Cooper’s Hill Cheese-Rolling and Wake has occasionally faced the threat of a doubtful future. Traditionally the event was conducted in a quasi-official manner. The 2010 event took place without management. It is hoped that it will continue to be held, following the launch of a 'Save the Cheese Roll' campaign. Despite the cancellation and lack of paramedics, around 500 people voluntarily showed up in 2010 to hold some spontaneous races, with six times champion Chris Anderson winning again.